"A divided Supreme Court ruled Monday that police may take DNA samples as part of a routine arrest booking for serious crimes, narrowly upholding a Maryland law and saying the samples can be considered similar to fingerprints. The decision overturned a ruling by Maryland’s highest court that the law allows unlawful searches of those arrested to see whether they can be connected to unsolved crimes. The federal government and 28 states, including Maryland, allow taking DNA samples. The court split in an unusual fashion. The dissenters were three of the court’s liberals, and conservative Justice Antonin Scalia, who amplified his displeasure by reading a summary of his dissent from the bench. “The court has cast aside a bedrock rule of our Fourth Amendment law: that the government may not search its citizens for evidence of crime unless there is a reasonable cause to believe that such evidence will be found,” Scalia said from the bench. He added: “Make no mistake about it: Because of today’s decision, your DNA can be taken and entered into a national database if you are ever arrested, rightly or wrongly, and for whatever reason.” Scalia was joined by Justices Ruth Bader Ginsburg, Sonia Sotomayor and Elena Kagan. Kennedy wrote that the decision was more limited than that: DNA can be taken from those suspected of “serious” crimes. He was joined by Chief Justice John G. Roberts Jr. and Justices Clarence Thomas, Stephen G. Breyer and Samuel A. Alito Jr."
Just how do you define "serious" Mr. Kennedy? Virtually aything can be labeled a felony or serious in the American police state. Does the Constitution even exist anymore? Should we trust the police enough to give them this power? Of course not. The police can and do arrest people on trumped up charges all the time. Now they can do it just to get your DNA. The difference between using fingerprints or facial feature recognition and a DNA swab is that they are non-invasive. 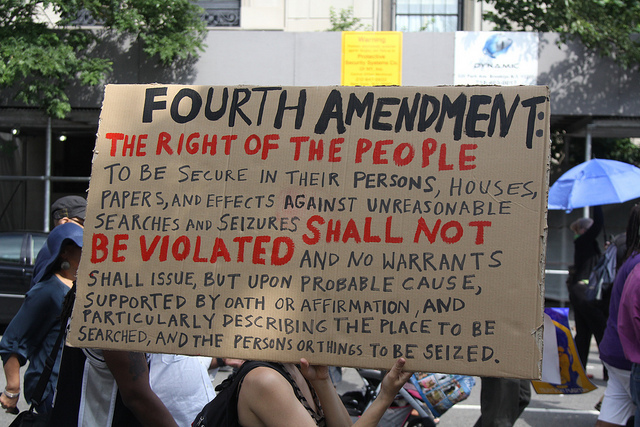 The Fourth Amendment states, "The right of the people to be secure in their persons, houses, papers, and effects, against unreasonable searches and seizures, shall not be violated, and no warrants shall issue, but upon probable cause, supported by oath or affirmation, and particularly describing the place to be searched, and the persons or things to be seized." It says nothing about embarking on a fishing expedition in hopes of solving other crimes. Additionally, this is a violation of the Fifth Amendment as well, in that it compels a person to provide his own body tissue in order to provide compelling evidence against themselves. Justice Antonin Scalia is absolutely right. This is a gross violation of our Fourth Amendment rights, and those "Justices" that voted in favor of this outrage need to be thrown off the bench.